← Register now for our upcoming spring webinars! 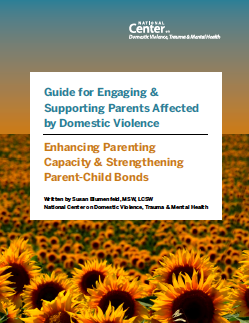 This guide is designed for staff in domestic violence programs and provides practical guidance for supporting parents affected by domestic violence in their parenting. Using core principles and strategies, the guide helps frame an approach that is aimed at enhancing parenting capacities and strengthening parent-child bonds. Through self-guided questions, reflection, and real-life examples, this guide offers a pathway for deepening our engagement with parents and holding sensitive conversations in the context of our relationships. This entry was posted in Highlights, News & Updates, Newsletter 2016 Summer / Fall Edition. Bookmark the permalink.